1. Make the marinade: Whisk together the garlic, mustard, Worcestershire sauce, lemon juice, olive oil, salt and pepper. Put the steak in a shallow dish, pour over the marinade, cover and chill the steak for 2 to 12 hours, turning occasionally. 2. Light the grill or heat a heavy skillet until very hot. Drain the steak and pat it dry, discarding the marinade. Brush the grill rack or pan with oil and add the steak. Grill or fry the steak over high heat until brown, 2 to 3 minutes. Turn and continue cooking until the steak is done to your taste. Allow 2 to 3 minutes longer for rare meat, 4 to 5 minutes longer for medium done, and test cooking with your fingertip. Transfer the steak to a cutting board and let it rest for 10 minutes. 3. Heat the oil in a frying pan (if using a skillet, wipe it out first). Add the onions with salt and pepper and sauté gently, stirring occasionally until softened and brown, 10 to 15 minutes. Toast the bread. 4. Slice the steak on the diagonal as thinly as possible, cutting across the grain. If you like mayonnaise or mustard, lightly spread them on the slices of bread. 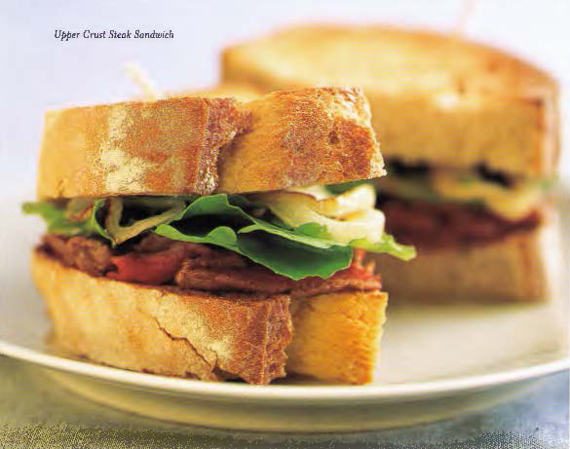 Layer the meat, arugula and onions on top and add another slice of bread. Cut the sandwich in half and serve while the steak and onions are warm. GETTING AHEAD: Cook the steak ahead of time and assemble a cold steak sandwich at serving time.